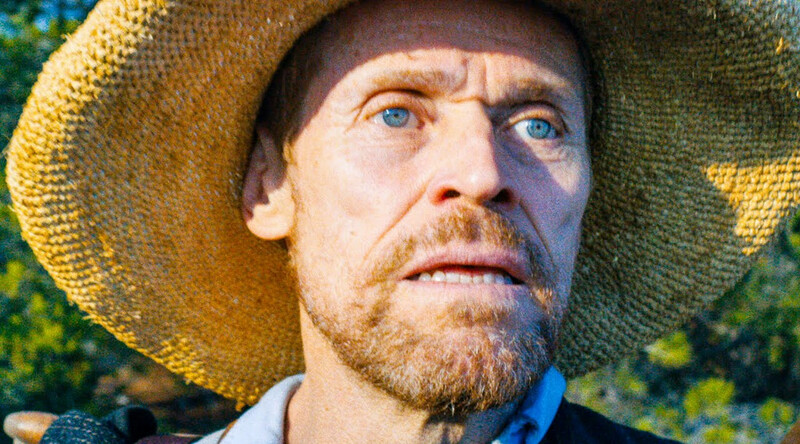 At Eternity’s Gate features a convincing performance from a perfectly cast Willem Dafoe as Vincent Van Gogh, but is otherwise dreary and tedious, failing to emotionally engage and offering little new insight into the great artist. At Eternity’s Gate is yet another dramatic account of everyone’s favourite tortured genius artist, Vincent Van Gogh, but brings little to the table we don’t already know. Director Julian Schnabel has chosen to focus on the fraught but highly productive last two years of Van Gogh’s life, spent in the visually arresting rustic setting of Arles, in the south of France. Inspired by the light, colours and rural landscapes, Van Gogh threw himself into his work and came up with some of his most acclaimed masterpieces, while suffering the privations of poverty and battling deteriorating physical and mental health (it was during this period that he famously severed an ear while confined to an institution). The one great asset of the film is Willem Dafoe, who is perfectly cast as Van Gogh. The physical resemblance is uncanny. And his being much older than his character is a plus – as presented here, Van Gogh is haggard and prematurely aged in his tormented final years. Appearances aside, Dafoe is suited to the role as an actor, and draws on his considerable talent to the full. However, director Schnabel and his co-writers don’t bring much of surprise to the character portrayal, apart from presenting Van Gogh as a Christ-like sacrificial lamb with prophetic qualities. “Perhaps I’m painting for future generations”, he ventures at one point. The closest we get to any significant new insight into the artist’s psyche or artistic vision is via conversational exchanges between Van Gogh and his friend and painter peer Paul Gauguin (Oscar Isaacs). OK as far as it goes, but it’s familiar territory (and the iconoclastic angry-new-generation-artist Gauguin never rises above caricature). Predictably, the camera features lots of rustic shots with references to Van Gogh’s paintings (yellow fields, leaves in dappled light etc), and fair enough. All too often, though, the camerawork is intrusive and distracting. There’s lots of messing about with narrow focus and jumpy hand-held sequences, I suppose to simulate Van Gogh’s disturbed perspective. It’s annoying and overdone, and ultimately serves no good purpose. It seems Schnabel is more intent on imposing his directorial style on the film than exploiting its dramatic potential. This is directorial self-indulgence at its worst. The effect is to distance and emotionally disengage us from Van Gogh. It doesn’t help that Schnabel pushes too hard for emotional impact. A case in point is a clumsy and implausible scene in which Van Gogh is painting alone in a rustic setting when accosted by a group of schoolchildren and their teacher, who deride his art and jeer him until he loses it. You leave the cinema with a sense of relief that it’s all over, rather than a lump in the throat. Another Dud Van Gogh movie? After the turgid script and all round tediousness of the animated one, aren’t we due for some good Goch sometime? Yeah, you’d think so – especially since VG’s such a compelling, tragic figure who has seized the imagination of the public as no other artist has. So where’s the great VG biopic? All the drama’s in place…but it ain’t happened yet. Not that I’ve seen at least. I seem to recall that there’s quite a few docos and fictionalised accounts out there. Can’t say I’m much inspired to chase them down at this point, though. Although that hat looked awesome. I wanted to see the crown, but sadly only the underside shown in trailer. Can’t say I can recall the crown. Thought it looked very Van Gogish overall, though. Sure that’s a big help to ya.